I’m sorry overflow. You’re lovely and nice and I like you, but like 12 people in the world follow you. So I confess, I cheated on you. I wrote two posts for a friends blog. 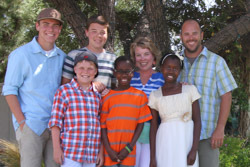 He was in Kenya and asked for some guest posts and I thought… hey, that might be fun. Life is hard. Ministry is hard. Balancing ministry and family and school and my own soul is hard. It just is… and it’s so hard, that life has a way of knocking good people out of the game. I’ve been in ministry long enough to have seen first hand the casualties of marriages, careers, families, and personal faith all destroyed by hard stuff and poor choices that followed. In an effort to not become a casualty of the same statistics, I had to confess this past December that I was becoming a victim of my own bad habits and neglecting the care of me for the care of others. I know this to be theologically and practically wrong, but I still was doing it. First to go was exercise. Then reading. Then sleep. Then eating right. Then…. I started kicking the dog. It was bad. Like many of you, when I signed up to be a youth pastor, I signed up to help students do life with God. I also believed then, and still do today, that there is no shortcut. It simply takes time. I also know that there is no greater way to spend big chunks of quantity time with students than the retreat setting. you can read the rest of it here. Ok overflow. I’ll keep spilling my thoughts on you. But come on… like 10 billion people read that other blog. I had to cheat a little.